As of right now, Hanover High School does not have a lunch period. Our school has a period from 10:45 to 11:15 set aside for Activity Period, a time to meet with teachers and clubs; Common Ground every Thursday and Council on Wednesday. Our schedule forces students to try and find a space in their day where they can fuel themselves. Some students, however, find it difficult to eat lunch when their schedules are jam-packed. Therefore, the school should provide a lunch period for all students. Lunch is important for all people. Eating a healthy lunch is important for many reasons; according to medical professionals, taking a midday break helps clear the mind. “Taking a lunch break and nourishing the brain with food, oxygen, and water lead to better work” (1). Professionals also note that “eating at regular intervals, and eating lunch, is vital to a healthy, balanced daily diet” (1). By not having a lunch period in our school, teens and young adults are deprived the opportunity of fueling their body. Teens need to have three balanced meals a day, so when they don’t have this balance, success is harder to find. Most kids are very active throughout the day with sports, after-school activities, work, and other extracurricular activities. Having lunch supports these activities because it gives students sustenance and gives them a better feeling about going forward in the day. I think many kids who feel ill during the day go home early not because they are ill, but because they are hungry. This means that these individuals are missing a day of school quite simply because they did not eat enough for breakfast. Kids are growing, and in order for them to grow properly, they need proper nutrition. We have a growing population of kids who don’t eat healthy options on a daily basis. 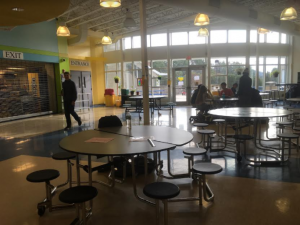 Because the school does not provide a lunch period, students who were not able to get food earlier in the day do not get a much needed break. We need three balanced meals a day, 7 days a week. Without this designated lunch time, students may eat junk food because it’s quick and easy or may have health problems due to not eating. According to one study, Physical Activity and Nutrition in Children (PANIC), “children who ate three meals a day had smaller waist circumferences and a 63% lower risk of being overweight or obese than those who skipped some of the major meals” (2). Is it not the worst feeling in the world when you are famished? I know I feel this way sometimes. When you are hungry it is just impossible to focus; you might feel ill because you aren’t eating and you aren’t given that opportunity to eat. We are teaching the adults of the future poor eating habits because the environment that they’re in currently isn’t giving them the options they need to eat. That’s all they know, so you’re telling me that when they graduate and they go to the work environment they’re going to skip lunch because that’s what they were taught in high school. Also, what are students going to do instead of having lunch when they’re an adult? They’re just going to snack when they’re hungry and work. And that makes a workaholic. If they continue to work without nourishment that makes them more susceptible to feeling more hungry and grabbing an unhealthy snack. What happens is we don’t follow the three balanced meal pyramid and that is disgraceful to our world. Why is the food pyramid designed to help people find nutritional value in what they eat if our actions contradict our words? In Hanover, the health classes touch on the subject briefly but don’t go into much detail. I believe it would do us some good if they emphasized the topic more. Then we would all learn more about the benefits of healthy eating habits. For me, I get to experience having a designated period for lunch and that helps me in a lot of ways. It helps me know when I’m getting lunch on a day-to-day basis, and helps me plan my day. Having lunch re-energizes my mind and gets me ready to go back to the task at hand. The designated lunch time makes it so that I am not focused on my stomach growling and being hungry, I am focused on working and paying attention in class. By having a designated lunch period, all of the students are able to eat in a place where messes can be cleaned up, like the cafeteria. This will eliminate having to clean up messes everywhere,but instead keep the food in one large place. Lastly, having a lunch period helps with social growth by helping students learn to communicate face-to-face. In conclusion, having lunch is important to fuel ourselves for growing bodies. Skipping lunch damages the body and creates problems focusing. And having mental breaks help clear the mind, de-stress, and strengthen communication skills. I firmly believe that having a lunch period will create a better, healthier generation. This is a very intelligent article about what I have always thought has been a real issue at Hanover High. When my children were there, I was on the Student Counsel and for three years tried very hard to get a lunch period into the school, to no avail. I support you wholeheartedly! !